Bat Week! Bat Week! Bat Week! Hi everyone! I hope you all had a good week! I would like to dedicate this week’s blog to all the people affected by last weekend’s events in Somalia. My thoughts are with you. And now for the most wonderful news of all…BAT WEEK is almost upon us!!! International Bat Week will be from October 24th – October 31st. There are exciting events scheduled all over the world for this wonderful event, but I am most excited about one scheduled in Washington, DC. Once again, there will be a “Bat Bonanza” Festival at the Botanic Gardens. It is being held at the Conservatory from 10 AM – 5 PM, and it is free! If you are in the area, please come out and learn all about bats. The Save Lucy Campaign will be there, which means Mrs. Sturges and our furry friends will be there. I am also going and I hope to see some of you there. For more information, visit here! In addition to the event at the Botanic Gardens, I am excited to tell you all about what the Bat Week team is doing. They are having a recipe contest! Just submit your favorite original recipe that uses bat dependent ingredients and you could win your very own bat detector! They are also having a photo challenge and would love to see pictures of you wearing some adorable bat ears. For more information, go to www.batweek.org. 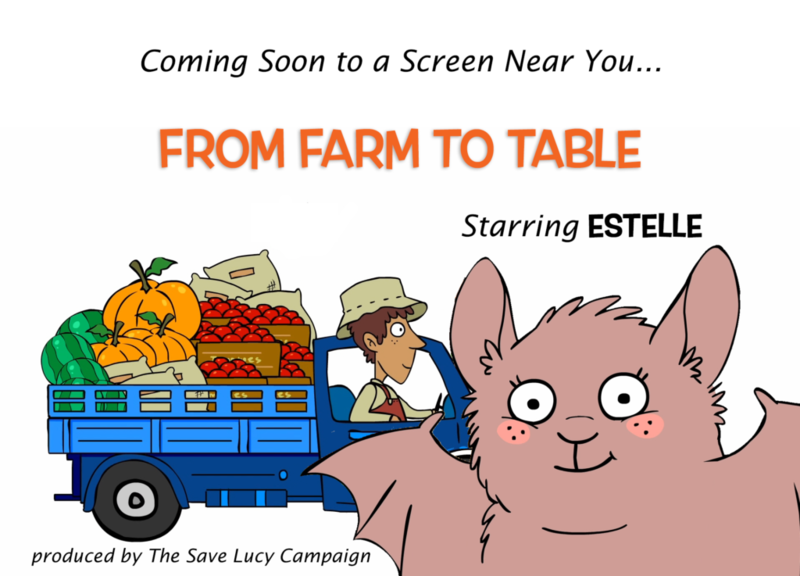 And in breaking news, The Save Lucy Campaign will premier a new animated short to kick off Bat Week. The film stars the adorable and hard-working Estelle! The new animation is made possible by a grant from the US Fish & Wildlife Service. Watch the Save Lucy Facebook page on October 24 for the premier. And, our friends at Sticks & Stones Bat Rescue have developed a baseball game that teaches about bats that you can use in classrooms or with friends! The game will be available through the Bat Week website. Check out a preview here! I hope everyone has been enjoying Bat Appreciation Month and I hope that you all have an especially wonderful International Bat Week!